A pregnant teenager runs away from her abusive home to find her biological father. But things are not as magical as she expected when they meet. I honestly thought Vanessa Hudgens will never be able to get a serious role where she can show off her acting skills. I mean, the High School Musical trilogy was cute – oh my gosh, I actually caught myself humming the song Breaking Free from part one as I am writing this – but it was only good for what it was: a movie for kids. And again, I am contradicting myself, since I was 20 when High School Musical came out and I loved it. Man, I am such a child sometimes. But my excuse is always the same: I am actually just watching kiddy movies so I know what’s good whenever I have children. Plus, I am a movie critic, so I have to watch them. There, you have it. 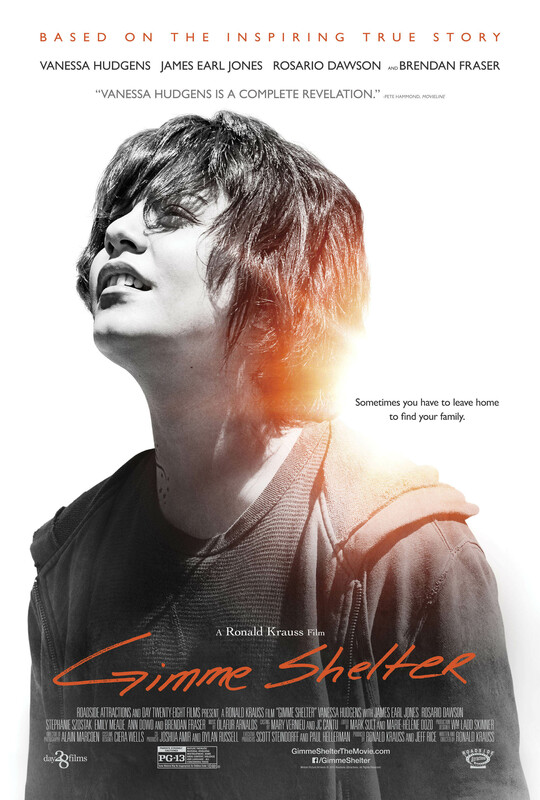 With Gimme Shelter Hudgens was given a very serious role and the opportunity to shine, which was definitely the case here; she plays a troubled teenager that flees from her abusive mother – brilliantly performed by Rosario Dawson – to find her birth father (Brandon Fraser). Even though he is very reserved and confused at first he lets her stay and tries to build up a relationship to her. But her terrible past causes her to shut down every time he reaches out to her. The keyword in this movie is “Trust”. Once it is broken it is hard to restore it. And If you have no one you can trust around you, your life can end up hopelessly and dark, and so will be your appearance. While I enjoyed all of the performances a lot, I was a little disappointed by the plot development; there were a few unresolved issues and plenty of ways to resolve them, especially between Apple and her mother. Also, the main characters and the approach to the movie seemed very distant, cold, dull and sad, which was very depressing to watch. But then again, I don’t know the story behind it, maybe that was exactly how these events took place and how each person acted in real life. Or maybe that was just the vision of the director. Either way, it might have been disappointing but at the same time, the outstanding performances made up for it. If you need a good drama or a reminder why you should appreciate life a little more, you can unscrupulously pick out Gimme Shelter. But you have to give me probs, at least I called her Jennifer consistently. Thank you pointing that out, buddy! Me either, which makes it so great! I liked Mariah Carey in Precious as well. She looked a mess!